I thought i would do a little feature over the next couple of weeks featuring a piece that we all know and love; The Biker Jacket. I have had my eye on this one i am wearing for months, then the kind people at Next offered to send one to me (yay! )about a month ago. So i thought i would show you lovely people all the different ways i like to wear my Biker Jacket. 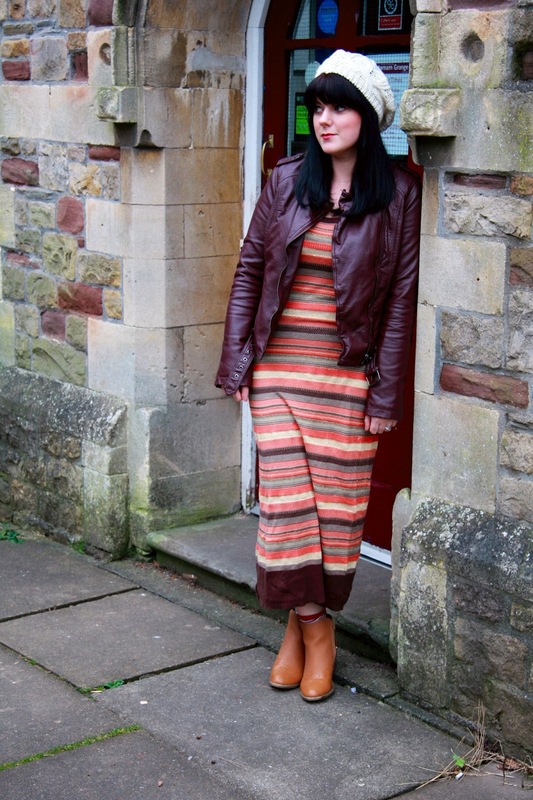 Maxi dresses aren’t just for summer,oh no no, this fine knit, long sleeved maxi dress is one of my favourite winter wears. I manage to sneakily put my thermal leggings under there too so, super warm and toasty. I have had this dress for couple of years and each year i really enjoy wearing it and remixing. When the biker jacket arrived this wasn’t the first or even second outfit i thought to put together, it actually came in to me one night last week and i thought i’d just have to try it! The burgundy jacket is such a great colour for adding to my wardrobe, it is the type of colour that goes well with blacks, browns and all the colours in between. I chose a brown type pallet for this outfit, finishing off the simple maxi dress with a slouchy cream hat and my tan sparkle booties. I was really pleased with how the outfit turned out actually (i do my best thinking at night time;-) and now i’m looking for more maxis to pair with the biker jacket. I want to try a maxi skirt avec en biker jacket too! i wore this outfit on Sunday when my darling mum had Neo for a few hours and we strolled around town and stopped for some coffee. It was very nice 🙂 As much as i love my son, a few hours apart is good for the soul! And the outfit was super comfy, the dress has a lot of stretch… my fav kind, heehee! Hubby also really liked the jacket… think that maybe he could finally relate to a piece of my clothing. Normally he just doesn’t get it and gives me looks of confusion. But this he liked! Maybe he thought i would be pulling out a surprise Motor bike from somewhere, i don’t know. But either way he appreciated my new beautiful jacket. Do you own a Biker Jacket? And would you wear yours with a Maxi? Love the glitter on these boots, and this dress and jacket work so so well together! I rediscovered a cropped biker jacket this year which I'd purchased about 4 yrs ago and forgotten about, so brought it out and removed the tags and have been wearing it a lot this year! That combination is so unexpected, but it really works well! Oh my gosh it is conker-coloured!! I would never think to wear one with a maxi but this outfit is just gorgeous. You little genius you. 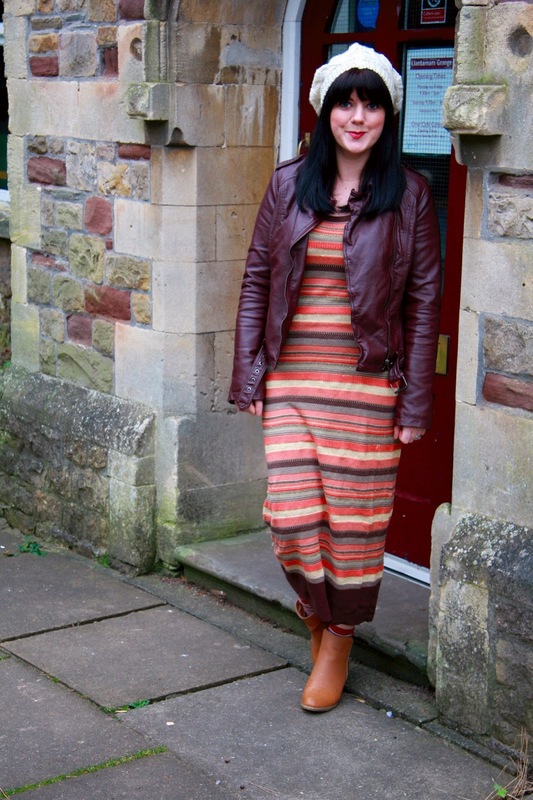 We love that maxi dress and it works so well with the biker jacket! what a great look! Those colours are fantastic on you Rachel. Beautiful! The color of that jacket is just so luxe! Love it with the maxi! Oh, thank you so much for calling it burgundy and not oxblood. Ugh…I hate that that's a thing. Anyway. I super duper completely absolutely love you in this outfit!!!!! The colors suit you so beautifully, and you can pull off a slouchy hat like no other. Love, love, love. loving this! I just found your blog from Shanna's link up! woot woot! yay for a new bloggy buddy! excited to be following along now! stop by and say hi if you get a chance. i love making new friends! I do not own one, but now I WANT TO! Super smart and thrifty way to restyle a dress like that also. I might break out a maxi tomorrow now! Such a beautiful jacket – the colour is incredible!! 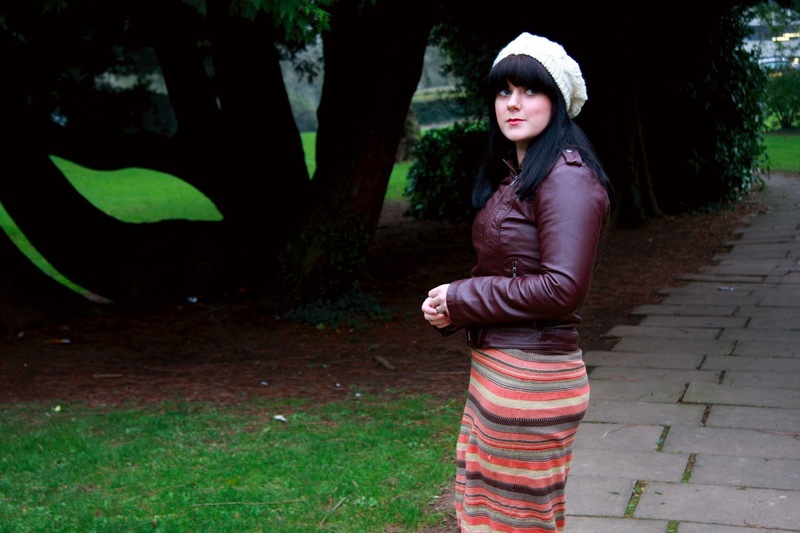 I always struggle with styling my maxi dresses and skirts for winter. You styled this perfectly! Thanks for the inspiration. Also super cute glitter boots. Cute dress and you look stunning! ooo i am LOVING that jacket with a maxi skirt. you know what, i've never thought to pair it like that and i have a ton of maxi dresses. how have i been so blind?! The colour of that jacket is amazing! 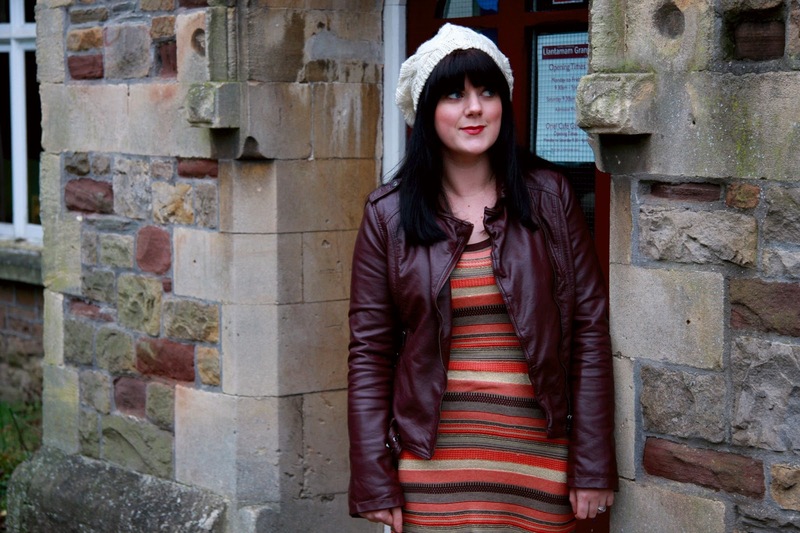 I have a black leather jacket but I'm always afraid it will get ruined in the rain and well I live in Scotland lol! Love this look and no I hadn't thought of wearing mine with a maxi but will now. 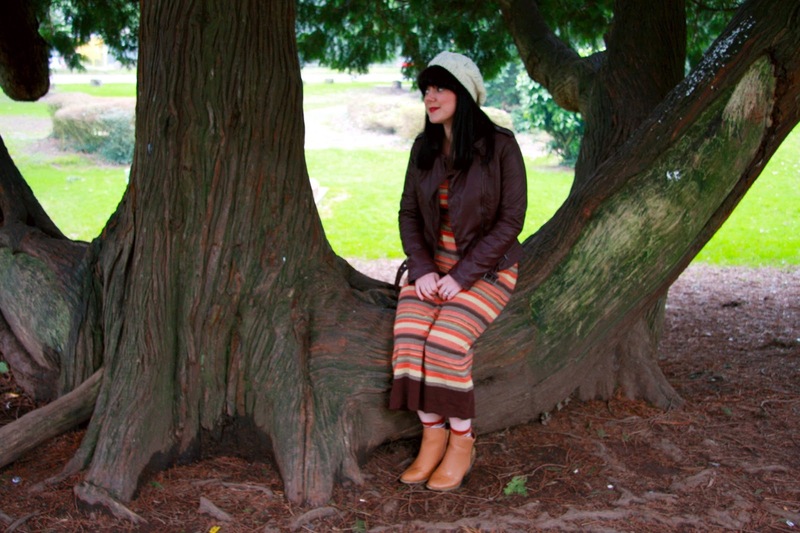 I love your dress too – still on the look out for a nice patterned maxi! Such a cute look! 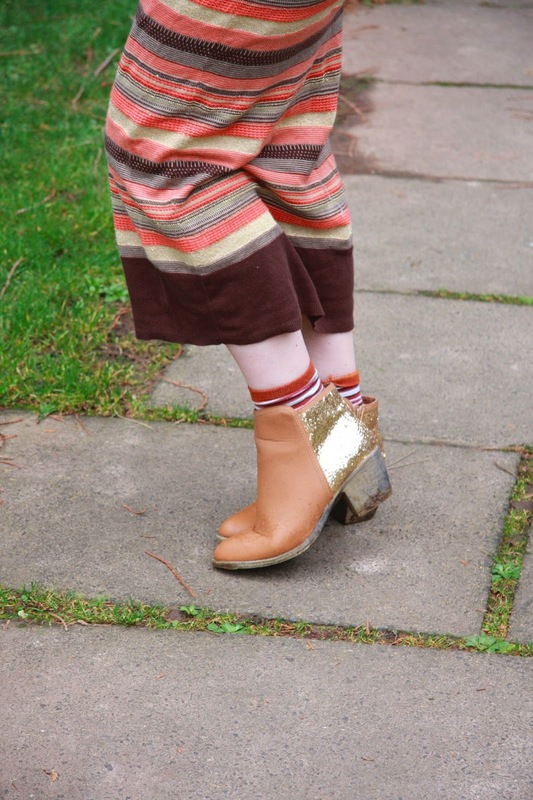 Love your boots! I have a basic black maxi dress that I almost never wear. Why? I have no idea! This post is giving me inspiration to try something unexpected with it! Jackets like this are just so nice and versatile. I wish I had a pretty brown one like this! I really love the color scheme in this outfit. It reminds me of fall. This is also one of the cuter maxi dresses I've seen! It looks very cute on you! I like the more fitted shape and the stripes. Those boots are the best things ever too. I love this combo it's feminine but with a bit of a harder edge – you look fab! :o) Thanks for being a Wardrobe Weds player this week. I absolutely love this jacket the colour is just fab. 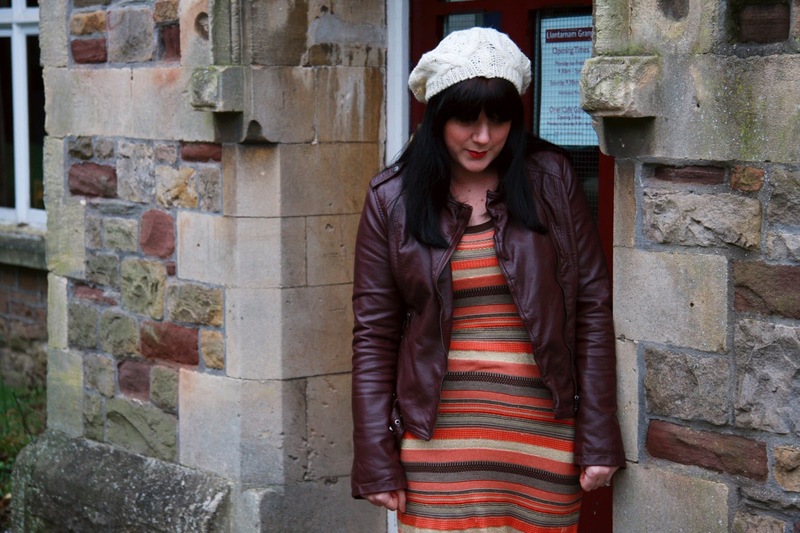 I have a black biker jacket (that isn't nearly as nice as this one!) and I would never have thought to put it together with a maxi like this so thank you – you've inspired me! 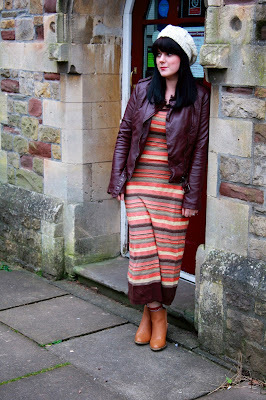 I love this outfit, the jacket is a fab colour and I LOVE that maxi! thank you so much for your visit on my blogg!!! great look!! love your biker jacket, i wear mine all the time!! I just got a biker jacket for Christmas, and I haven't been able to wear it yet because we've had way too cold of a winter, but I can't wait to start wearing mine with dresses! I do own a biker jacket but I'm looking to upgrade as mine is a little bulky – it's been too cold to wear it recently though! I'll have to try my jacket with one of my maxi dresses. Mine might not be fitted enough 🙁 You look wonderful!